Square has launched a free, standalone invoices app called Square Invoices in an interesting expansion of its portfolio. The payments platform already has a free point of sale app called Square POS and continues a disruptive push into the accounting software space for micro-businesses and new businesses. The invoicing app includes premium features found in paid accounting software. For example it includes automatic payment reminders (which Xero added in 2015), tracks payment status of each invoice (opened, overdue and paid), and can attach documents and receipts to invoices. It’s a clever move by Square. Even relatively new technology is becoming commoditised so quickly that it is now an incentive to use a payments platform rather than worth paying for in its own right. It also pressures the accounting apps. Xero’s cheapest edition costs AUD$25 a month and is limited to sending five invoices. The next edition, with unlimited invoices, costs AUD$50 a month. And that doesn’t include a point-of-sale app or a payments platform. Intuit’s QuickBooks Online costs AUD$10 a month for unlimited invoices and it also owns the payments platform. However, you will still need to buy a point-of-sale app. The free software brigade is growing. Wave kicked it off with an ad-supported model, and there are signs that banks could release their own accounting software to improve retention. Will Square release a basic accounting app? It clearly has the capability. Or will it keep releasing operational apps that plug into a basic ledger from an accounting software company? The upshot is that Square’s strategy affects the top of the funnel for Xero and Intuit. Every business starts off small. A fast-growing business will quickly need something more robust than Square’s apps – but Square could have a big say in where they go next. Square Invoices is interesting development and Square is one to watch. The Square Invoices app is now available in Australia, the US, Canada, Japan and the UK via App Store or Google Play. Oracle NetSuite kicked off its global conference series SuiteConnect 2019 in Australia. where they shared their achievements and aspirations for this year. Here are some of my favourite moments and ideas. Australia, we count. Big time! The year 2016 was frequently mentioned throughout the day. This is when Oracle bought NetSuite, a significant milestone. 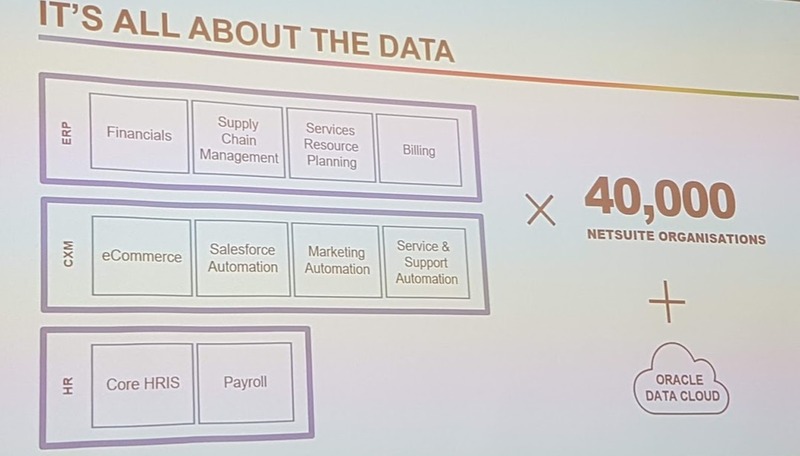 Adding up the numbers from two different talks, it seems that Australian customers make up 20 percent of NetSuite’s new client acquisitions since 2016 globally (600 out of 3,000 new sign ups). This is huge since we are talking an American product that is well established in the US market. Note: while these numbers were mentioned on stage, I could not confirm them later chatting to NetSuite execs. Either way, the evident huge investment in the conference shows that Australia considered a primary market for NetSuite. There was a lot of talk about SuiteSuccess, Netsuite’s new implementation model that is claimed to have cut average implementation time, cost (and the toll on mental health, I suppose) by a staggering 50 percent. Turns out that much of the intensity of ERP implementations stems from the need to customise a standard platform to the unique needs of a business. This awkwardly makes us all assume the role of software architects, really. The new approach sensibly recognises that there is a lot in common across businesses. NetSuite have done their homework in pre-configuring the platform – for our region (thank you), and for particular industries and circumstances. SuiteSuccess is based on ready-made templates, a pre-defined set of roles and permissions, an abundance of saved searches (NetSuite’s powerhouse of in-app querying facility), and dashboards and forms already optimised for numerous user roles. The teams push back on customisation, at least initially, so that implementations are faster and more successful. This leaves significant money on the table; NetSuite’s approach will reduce its revenue in consulting fees. A refreshing choice coming from a company whose revenues are part subscription, part professional services. Well done favouring long term success over short term revenue, NetSuite! The magic in these tools is that they are not based on human defined rules. They are live, machine learning algorithms that constantly hunt for patterns in our data and use them to make real time suggestions. And if you prefer to read, here is more detail. JCurve Solutions, a Netsuite award winning implementation partner, invited some of their clients to share their stories of moving to ERP. While you could sense that they were on their best behaviour as guests of the organisers, their insights were still valuable, inspiring and thought provoking. ‘It’s that confidence in the numbers that enables you to grow’. ‘Data is the new oil’ says Tom Griffith from @EmmaAndToms speaking about the growth of their business. Given the vast amount of data that NetSuite gathers, one would expect it would start gleaning insights and constructing business ideas from it. This is how big Big Data can get. This is how much data @NetSuiteJAPAC has access to for benchmarking and learning about what works and doesn’t work in business. @JasonMaynard says they use it to proactively help their clients grow. NetSuite claims to have learned how to use this information to identify that a business is ready for the next step of growth. And then, offer their templated approach to take the business to the next stage. I don’t know if they are actually doing this, but I love the idea. I think more cloud software providers should adopt it. You have the data, tell us what it shows! We learn something new every day, and at the event I learned about Searchandising. It means organising the search results in an ecommerce situation not just based on search relevance. It also predicts what the user actually means given everything we know about them, and then places other relevant merchandise in the search results. Just like merchandising in a physical store. I can’t wait to see the next chapter in ERP for small business. Disclosure: Inbal Rodnay Steinberg travelled to SuiteConnect 2019 in Sydney as a guest of Netsuite. How personalised would you expect your interaction with your ERP system to be? Turns out, our operational apps can be more adaptable, more proactive, and more insightful that we’ve ever imagined. Oracle NetSuite ran its SuiteConnect conference in Sydney this week. Paul Farrell, VP industry product marketing and Jason Maynard, SVP global field operations, shared some exciting ideas about the future of ERP. These are not rules that someone created in the system. It is simply the system watching my on-screen behaviour, identifying patterns, and predicting what I will do next. My favourite part is that it marks every action it takes, and shows a little tooltip that explains the rationale behind it. It will be interesting to see what it teaches users about the workings of their own intuitive decisions. I love this new sense of elasticity in a system category that we traditionally perceived as rigid and heavy. 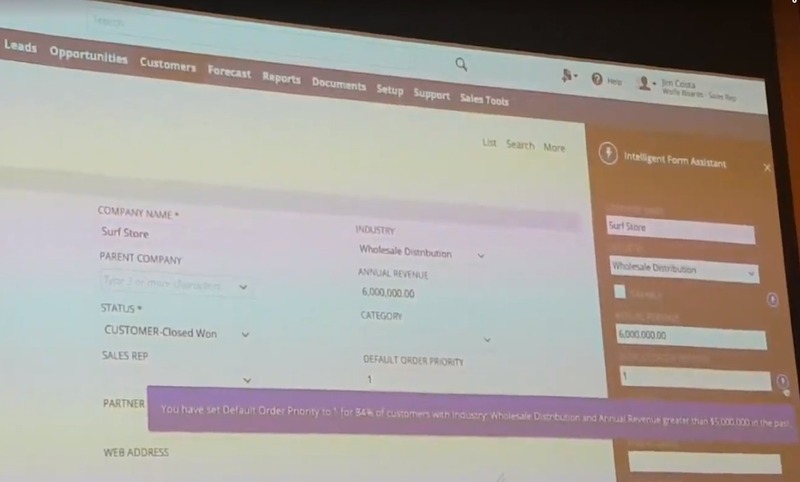 Netsuite’s Form Assist suggests: You have set Order Priority of 1 to 84% of customers with industry Wholesale and Annual Revenue greater than $5M. What Paul showed next, gave me the same feeling I had when I first experienced a sports car from the driver seat: right, now we have power, let’s go! As background, we looked at how “analytics latency” drives “reaction latency”. So: Detect -> Analyse -> Decide -> Act. Every step that requires a human, will take time. Any step that can be automated will shorten our time to resolution and minimise the potential damage. 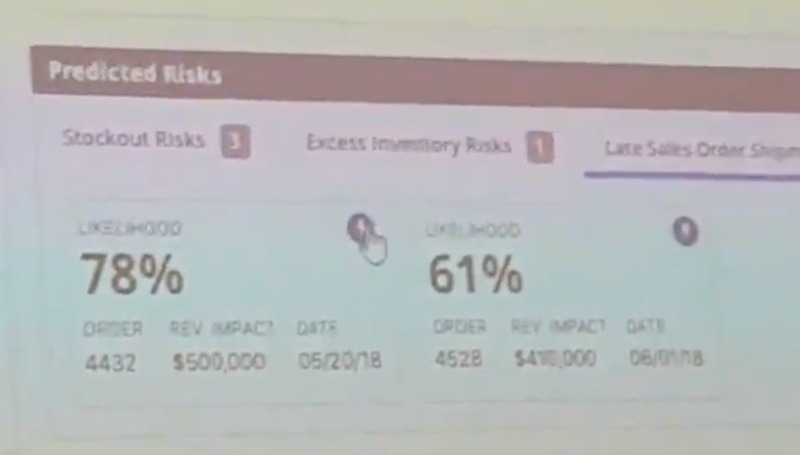 Paul showed a live demo (recorded, but real working system) of Netsuite’s Predictive Risks page. It showed that a certain shipment is at risk of being late. At risk, but not late yet. We are predicting a problem before it actually happened. It then goes on explaining (Analyse) that this is because 61% of the shipments by that shipper over the last week were late. It then suggests a solution (Decide). The ERP should fulfil the order from another location from which 89% shipments arrived on time in the last week and it also has excess inventory. Finally, I can authorise the system to just go ahead and apply the fix. This saves me the hassle of updating orders across the system. So we’ve seen the system convert ‘identifying that we have a problem’ to ‘predicting that we are at risk of having a problem’, explain the reasoning, suggest a solution, and carry it out. The effect on reaction latency must be huge here. It turns the whole idea of reporting on its head. I don’t want to review reports. I want this enormous computing power to analyse, predict and really think for me. Consider the colossal amount of business data that Netsuite has access to. More than 20 years of business data, across 40,000 Netsuite users plus access to (anonymised) Oracle data cloud. Data + machine learning = better business results. Oracle Netsuite has a group of savvy data scientists fine tuning a bunch of sophisticated algorithms to draw business potential out of data. Privacy concerns aside, there is a lot to be learned from such a treasure trove of a dataset. NetSuite claims to be able to recommend business improvements and fine tuning, but more excitingly, opportunities for growth, based on machine learning algorithms analysing our business data, and the cohort of other businesses in our industry. 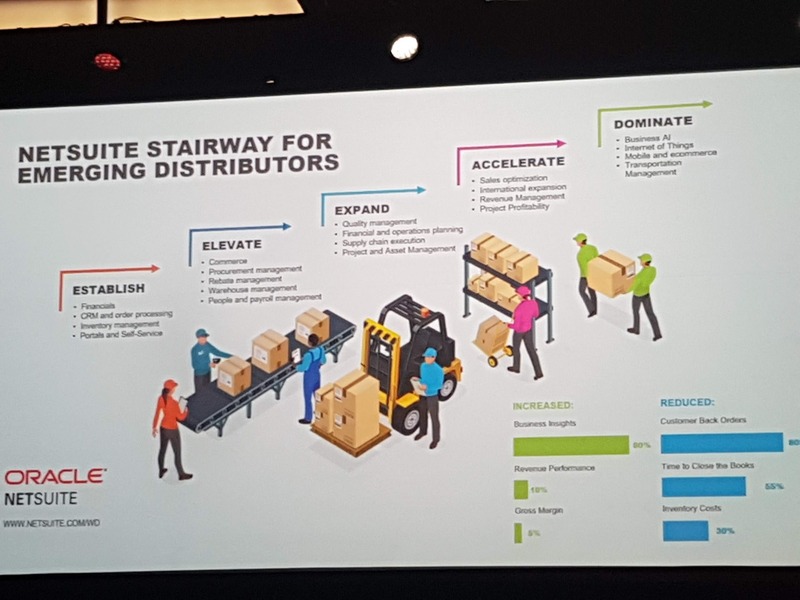 NetSuite can identify that one of its users is at a prime position to grow into a new market, optimise their pricing structure, or bring manufacturing in-house. Speaking to Netsuite partners it seems that they still don’t have access to this knowledge to make growth recommendations for their clients. But assuming that the tools are being cut and sharpened now, the power of ERP systems for small business has just been supercharged, big time. Disclosure: Inbal Rodnay Steinberg travelled to SuiteConnect in Sydney as a guest of Oracle Netsuite. Recommending apps is clearly one of the strongest ways to increase the relevance of your firm. Ian Yesberg of Regional Business Services, in Australia, has adjusted the composition of his staff by hiring more tech-savvy juniors to research apps and find recommendations for tradesmen and health professionals. Digital First: Why do think you are a finalist? Yesberg: We’ve probably gone a little bit harder, a little bit faster, than other people that we come across in the ProAdvisor community. That’s the only reason. I see a lot of us are all on the same journey; we just seem to have got there a little bit quicker. You can count on one had those we don’t have on cloud accounting software. We do some advisory, and we get involved in social media, to expand our reach. Digital First: With advisory, what exactly do you offer? Yesberg: There’s the standard financial accounts and we use Fathom for that. I’ve been doing this for 18 years. Prior to that, I had 25 years in commercial finance in a bank. Back in those days we actually pulled apart financials. Since I left the bank we’re now creating the financials, so we’ve got a fair insight into that. We’ve always talked to our clients if we think things are moving not quite right. We also take advisory to mean introducing small business productivity apps to help get their business more efficient. Digital First: So what type of apps, and how many apps do you feel comfortable recommending? Yesberg: We stick to a smaller number. The apps we use ourselves in our office environment, and then point of sales, mainly job management type software, point of sales, your Google Drives. ServiceM8 is a big one. They’re the main areas. Digital First: And how do you recommend apps? Do you have one person in the business who does it, or does everyone who’s client facing has some experience? Yesberg: There’s three of us who get involved out of eight staff. One spends all their time in it. In term of the apps, we do a bit of research then go to the client, and offer them three packages. Which is really we’ll get you up and running and then you’re on your own, through to we will help you fully implement it, train you in it, and provide support for two or three months while you’re getting things going. Digital First: How do you find the time to train yourselves in all these apps so that you can train your clients? Yesberg: Not easy. The two or three of us who do it are probably all tainted with the same brush; we just like to fiddle with things. It’s more an interest, and probably more done outside of normal work hours. But if we come across someone who’s done something similar, we see things that work with other clients. We’ve got a couple of hundred clients, and they tell us about (a new app), and we then go away and focus on that or look at the alternatives that others are recommending. Digital First: Do you focus on any specific industries? Yesberg: Two or three. The health industry is our target for the next 12 months for bookkeeping, advisory or working with them on their KPIs. We’ve been working with that industry for 20 odd years, so we know it inside out. Then probably the tradie industry. We’re not specifically targeting that as such but we get a lot of referrals in that area. And that’s more your plumbers, using apps like ServiceM8 and simPRO or Tradify,, which are fairly common in that industry. Digital First: Do you think that you’ll look for staff who are interested in technology more than accounting? Yesberg: We’ve just started with a third year accounting student in the last couple of months. We’ve hired her specifically because she’s far more advanced in their knowledge and skills in tech than I will ever be. It’s native to them, where it’s not to me. We’re using that as a bit of a test, but if that works out, we’ll bring on more staff with those skills. Digital First: And do you think this is a model for accounting firms, that clients would be turning to accountants for technology? Yesberg: Yeah. We’ve had a deliberate strategy. Our staff are aged from early sixties through to Catherine who’s 20. And we find that that works really well because the clients I’ve got a rapport with are all starting to think about selling their businesses and moving on. The younger people can react far better on a day-to-day basis. So in some ways, it’s a deliberate strategy to make sure we’re remaining relevant to all sectors of the market, to all demographics. Digital First: And in terms of automating the compliance work flow, what have you found has made the biggest impact? Yesberg: Without a doubt, it was the bank feeds, that started with us. Then we started 18 months ago with Hubdoc. Even simple things like a rule in Outlook that when a statement or an invoice comes into the customer’s inbox, a copy is automatically sent straight through to Hubdoc. When an item comes into Hubdoc, it can automatically save a copy into the QuickBooks and the client’s Google Drive. So when clients go looking for what used to be bits of paper – invoices, statements – they can actually access that in Google Drive without necessarily looking into QuickBooks, which we’re working on all the time. So the little things within the apps, if you really know the detail of what they can do, it can really make that automation experience that extra step. So it’s really knowing your products intimately that we use in-house, that is what makes the difference. Michael Ly is convinced that the rapid growth of his three-year-old firm to 18 staff is connected, at least in part, to the location of its head office. The firm, Reconciled, is in Burlington, Vermont, a city and state associated with the good life. Not that all 18 staff live in Vermont. Reconciled has a distributed or remote team that communicates via video (Zoom, Google Meet) and chat (Slack). The work-at-home vibe contributes to a culture that flows through to better customer service, Ly says. Digital First: Why do you think you are a finalist? Michael: The reason that we are a finalist is the Intuit is recognising the work that we have been doing over the past three years. We have 18 people, working in five states, and we have established ourselves as a pioneer in the online bookkeeping space. We are a distributed virtual team and we leverage all the technology that Intuit has given us as a firm to serve our clients, as well as the app ecosystem. (Other reasons for our selection include) the team that we have built here at Reconciled and obviously the growth that we have been having as a firm. Digital First: How are you a pioneer? Michael: I think we have built a brand that customers can trust. When our customers look at the landscape of what’s being offered to them with cloud based accounting firms they look for a brand story, a trusted brand that they resonate with. They see my story in starting Reconciled and it resonates with their own story as an entrepreneur. Cloud based accounting firms might be the norm in the rest of the world but it’s not the norm in the US. it’s still a small percentage of firms that are cloud based and distributed. Digital First: What is it about your brand that makes you trusted? Michael: I think that they want a genuine, authentic person behind the brand. I moved to Vermont to raise a family and I wanted to find a way to build a business and a legacy for my family while doing it from a small state and city like Burlington, Vermont. Burlington is known for high quality products. When we talk to customers a lot of them say they like that we’re in Burlington, Vermont. Even though we’re not in the same state we resonate with the story and what Vermont represents – high quality products and services, progressive values, as well as a meaningful life. You hear a lot of stories coming out of Silicon Valley but a lot of entrepreneurs desire the higher quality of life that Vermont has to offer. Digital First: I don’t know anything about Vermont. What high-quality products does it produce? Michael: Ben and Jerry’s, a famous ice cream brand. Seventh generation is a high quality cleaning brand. Lake Champlain Chocolates. We also have the highest amount of breweries per capita in the US. We have really high quality alcohol. A number of tech companies have come out of here. Probably the most famous guy to come out of here is Bernie Sanders. He’s down the street from my house. Digital First: So your clients are getting a slice of high-quality life by using you as their bookkeeping firm? Michael: Yes, and they can see that our employees are not hurried or rushed. They work as a distributed team and from home so they are able to enjoy their lifestyle and work. Rather than getting in a car and driving to an office (every day) our employees can invest that time into their families and community. Our clients understand that they are much more fulfilled. I’ve believed that if I could give quality of life for my team it would resonate out through their services. Because the work that they are doing can be repetitive work – reviewing financials and transactions. It can also be stressful. We built a work environment and we have given them a normal amount of work that a normal human being can do. I really think our team is happier and fulfilled and that reflects in the way that they communicate with our clients. Digital First: So culture is a big selling point? Digital First: Do you provide advisory and software implementation? Michael: We have a standard software stack for clients. We use Receipt Bank, Bill.com and QuickBooks Online. Then about 25 percent of our bookkeeping clients sign up for advisory services. These would be anywhere from cashflow forecasting, estate planning, helping them raise money with a bank or investors, big debt negotiation and general management and advisory services. We also do app implementation and heavy research in apps when our clients request us to – it could be inventory or supply chain or e-commerce reporting. We demo the apps to the clients and implement the software. Digital First: How do you charge for the R&D? Michael: Almost all of our work is done on value pricing. We can estimate the amount of time that it will take to do the implementation and the value it will bring to the client. Digital First: You must have multi-skilled people to cover that range of apps? Michael: We have technicians who understand not just the bookkeeping side but understand the apps. We designate our team specialists; they choose one or two specialty areas in their research. We have a person that is into e-commerce related apps, another on sales tax for multi-state sales tax reporting, we have somebody on our team who is a blockchain expert and a cannabis expert. There are a variety of different areas and we let our team members choose what are they want to specialise in. Digital First: Isn’t that a strategic decision about which industries to go after? Why let teammates choose? Michael: We have been able to define our strengths and skillset. We target e-commerce companies, digital marketing agencies, breweries, distilleries and wineries, so we have a few areas of expertise. We also actively work with cannabis companies. There are only a few accounting firms that will work with cannabis companies because cannabis isn’t federally legal on the hemp side. Some firms are avoiding working with them until it is federally legalised. (It’s the same with blockchain.) Not many accounting firms understand the nuances and questions that blockchain companies have to deal with. Digital First: What are those nuances and questions? Michael: Some of the questions that come up – are smart contracts legal in the state I’m operating in? Will they be acceptable in a court of law? In an open blockchain who are the owners and partners of the company if you have miners that participate in creating a blockchain and making the blockchain bigger? Are miners considered partners or owners? Do people exchanging coins on your blockchain receive 1089 forms or are they considered contractors? Should you do a coin offering or not and what are the tax implications? Digital First: Do you have a larger R&D budget or training budget? Michael: We require all our bookkeepers to receive their certifications before they can start working with the client. That usually takes them a week or two to finish them and start getting familiar with all the internal apps. We use Slack internally to do efficient communications as a team. Often we’re the first company that introduces them to tools like Slack or Zoom or Google Meet. Digital First: Are you using QuickBooks Online Accountant and Slack? 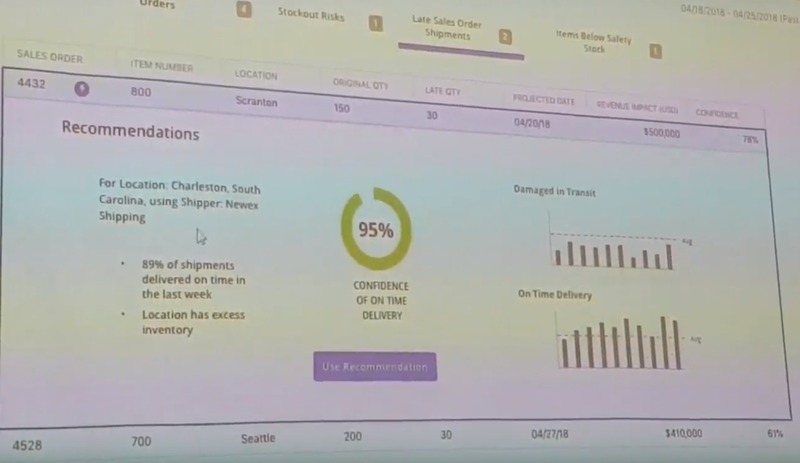 Michael: We’re probably one of the largest firms using that integration. We have a private slack channel for every client that we’re working on. We can integrate QBOA’s work tab with that. It’s been very helpful as a reminder and a pulse of where bookkeepers are at with their work.